TorQ Percussion Quartet was formed by four Canadian percussionists looking to add new vitality to percussion repertoire and performance. Renowned for their engaging performances, this dynamic group is committed to making new music accessible to audiences that span generations and geography. 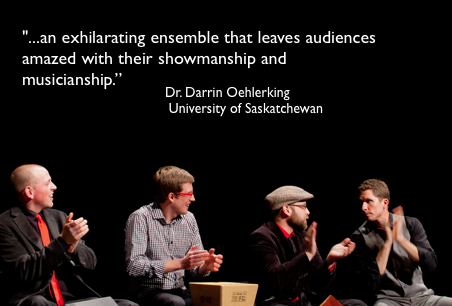 TorQ has performed to critical acclaim and standing ovations across Canada and beyond, including performances at the International Percussion Quartet Festival (Luxembourg), and at the Percussive Arts Society International Convention (Indianapolis). With a dedicated commitment to music education, TorQ student concerts are designed to appeal not only to the percussionists in the school band but to all the students. Whether or not they play an instrument, they will be engaged and excited by a TorQ performance. This concert will include a number of different musical styles on a variety of instruments, including marimba, vibraphone, hand drums, snare drums, cajon, and other small instruments. The members of TorQ offer explanations of the compositions and instruments, and often include interaction and/or improvisation with students. The Toronto Youth Wind Orchestra is proud to continue providing unique educational programs through our Student Concert Series, and we hope you and your students will join us for this exciting presentation! For more information on how to arrange for your class to atttend a TYWO Student Concert, click here, or call us at (416)321-TYWO (321-8996).